How a septic system works? For those living in a home served by a septic system or if you are thinking about buying one, this information is for you. The Department has written a Homeowner's Manual and other guidance to help people understand the science and best management practices involved with onsite wastewater treatment technology. For starters, New Jersey law requires people to conform to various statewide standards. These rules titled, “Standards for Individual Subsurface Sewage Disposal Systems,” ensure the effective removal of disease-causing pathogens and chemical nutrients from domestic wastewater. In addition to the law, NDEP has developed guidance and encourages all municipalities and septic owners to manage and maintain their septic systems to prevent system failures which may result in untreated wastewater being discharged into the environment. When buying a property that is served by a septic system NJDEP recommends that all interested purchasers secure a septic system inspection to ward off any costly repairs or liabilities following a real estate transaction. New Jersey has established an inspection protocol, so it is encouraged to review the protocol before inspecting. This guidance titled, "Technical Guidance for Inspections of Onsite Wastewater Treatment and Disposal Systems" is a key document in the Onsite Wastewater Management Program. Inspections are important because they determerine that a system is currently functioning properly and can help to determine if the system will suit long term needs, such as future additions, plans for decks, swimming areas and other construction projects. Also people planning pre-purchase home construction and are unsure of their septic system location and its condition, should consider securing an inspection before proceeding, because heavy machinery and certain construction materials such as paint and solvents can inadvertently damage a septic system or alter its performance. Lastly, all homeowners thinking about buying a septic system should know that proper care begins setting up a maintenance schedule (such as with any home utility, like a furnace) and knowing what can and cannot be discharged into the system, which is then recharged into the groundwater. If you have problems with downloading documentation, contact NJDEP's Bureau of Nonpoint Pollution Control and request to speak with someone from the Onsite Wastewater Management Program at (609) 633-7021. While the processes that treat wastewater are complex, the way a conventional septic systems works is really quite simple. When a person flushes the toilet or empties a bathtub or washing machine, the wastewater follows the plumbing, usually by gravity, to the septic tank. At the tank, the solids settle out and the liquid stays long enough to become fermented and to become enriched with beneficial bacteria. The septic tank is usually made of concrete, fiberglass, or plastic, is typically buried and should be watertight. All septic tanks have baffles (or tees) at the inlet and outlet to insure proper flow patterns. Most septic tanks are single compartment; however, some people install two-compartment tanks or two single compartment tanks in series. While typically designed to hold a minimum of 1000 or more gallons of sewage, the size of the tank may vary depending upon the number of bedrooms in the home and state and local regulatory requirements. The primary purpose of the septic tank is to separate the solids from the liquids and to promote partial break-down of contaminants by microorganisms naturally present in the wastewater. The solids, known as sludge, collect on the bottom of the tank, while the scum floats on the top of the liquid. The sludge and scum remain in the tank and should be pumped out periodically. Solids that are allowed to pass from the septic tank may clog the absorption field. Keeping solids out of the absorption field not only prevents clogging, but also reduces potentially expensive repair or replacement costs and helps ensure the ability of the soil to effectively treat the septic tank effluent. 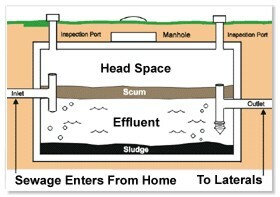 Image showing the basic diagram of inside a septic tank. Therefore, an additional safeguard in keeping solids out of the absorption field is the use of effluent filters on the outlet of the septic tank. The wastewater (effluent) coming out of the septic tank may contain many potentially disease-causing microorganisms and other pollutants such as nitrates, phosphates, and chlorides. Image showing animation of basic disposal field cross-section. wastewater through physical, chemical, and biological processes. The soil also acts as a natural buffer to filter out many of the harmful bacteria, viruses, and excessive nutrients, effectively treating the wastewater as it passes through the unsaturated zone before it reaches the groundwater. This treatment primarily occurs at the top of the zone of treatment, where a Biomat develops, consisting of living beneficial bacteria, organic matter, and mineral precipitates. The Biomat provides a substrate for decomposition of the "bad" bacteria. The "clean" wastewater enters the ground water again in the "Zone of Disposal", which is typically permeable soil or rock material that is above the water table. If the zone of treatment has adequate oxygen, which occurs when it is separated from the water table by at least 2 to 4 feet, it effectively converts ammonia nitrogen to nitrate nitrogen, and it reduces the number of harmful bacteria and viruses to levels that are safe for humans. Even after treatment, wastewater still contains nutrients, such as nitrates and phosphates, that in excessive amounts may pollute nearby waterways and groundwater supplies. Excessive nutrients in drinking water supplies can be harmful to human health and can degrade lakes and streams by enhancing weed growth and algal blooms. Some of the nutrients are retained or become assimilated by plants and microbes, but much of the nitrate nitrogen and some of the phosphates still discharge to the ground water, and may enter streams and can cause or contribute to the eutrophication. Therefore, though generally safe for humans, the conventional septic system is responsible for a certain amount of water pollution even when the system is working perfectly. Requiring distance setbacks from streams and potable wells provides the final level of protection. With the setbacks in place, and as long as the septic systems are not malfunctioning, homeowners can be assured that both drinking water and surface water are adequately protected.